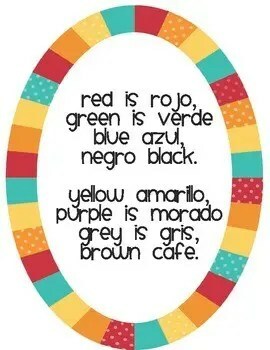 Spanish colors are a great lesson for kids learning Spanish! Since colors are used to describe so many things, they are a very useful concept. Additionally, if you are teaching young kids, reinforcing colors themselves is always fun and useful. Moreover, I like to incorporate various concepts into lessons, and colors are a great way to do this. First, I start and end class with welcome and good-bye songs. For example, I use the following songs. Specifically, the Hello Song is sung to the tune of Frere Jacques and the Goodbye Song to the tune of this hello song: http://www.mamalisa.com/mp3/hello_and_how_are_you.mp3. What’s more, you can download a FREE printable of these songs here. Next, I introduce the Spanish colors using cards I created and laminated. To start, there is one card (seen below) that features all of the colors. Specifically, I show the kids the card (project it on the board if possible) and go through each of the colors. I point to the color, say it in Spanish, and have them repeat. So that they are really comfortable, I have the kids repeat the words 2-3 times each. In addition, there are 11 more cards, each with a different color and pictures of a bunch of items that are commonly that color. Click here or on the image to download the entire set for only $5 at my TPT store! After we go through the Spanish colors, I read the story Purple, Green & Yellow by Robert Munsch. During the story, each time a color is mentioned I say the Spanish word instead of the English word. Additionally, before reading, I pass out the color cards (if possible to have copies for each kid that is great, otherwise a set for a few works fine too). Then I instruct them to raise the correct card up whenever they hear the color. Undoubtedly, they love to be involved in the story! Additionally, I love these books if you have time to share with your students! Next, we sing a song. To start, I hand out a Colors Song that you can download for FREE here). Songs are a great way to reinforce Spanish vocabulary. Specifically, we sing this to the tune of Frere Jacques. Finally, we do an art project to use everything we learned. To begin, each child traces his/her hand onto a piece of construction paper. Next, students repeat this with each color of the rainbow. Then students write the Spanish word for each color on the hand. After that, the kids cut out the hands and glue them onto a bigger piece of paper in a rainbow pattern. At this point I provide cut-out letters for the children to glue on to spell out Los Colores under the rainbow. Finally, the children write “My favorite color is …… because …..” on the bottom. For example, “My favorite color is amarillo because I like the sun.” Moreover, if you have higher level students, you can even have them use more Spanish. For instance, “Mi color favorito es rojoporque me gustamanzanas.” They turned out super cute! Unfortunately, I can’t find the pic of the sample I made for the class, but if I do I will certainly update this post! Although the entire lesson takes about an hour, it can absolutely be broken up into shorter sessions. In fact, you can even do each activity as a different lesson! If you like this lesson, please check out my Spanish lessons on numbers, animals, and the alphabet! It sounds like a fun class! My guess is you will have more students soon, if others can still join. I’m so glad there are teachers out there making Spanish fun for kids! If you need any ideas, check out Spanish Playground. ¡Que lo pases muy bien en clase! It looks and sounds like you are doing a great job of teaching color fundamentals to these young Spanish students. It always helps to make the subject matter fun and more interesting. Very nice! Hola, gracias por tu comentario. Creo que hay que buscar recursos de ESL. Aquí es un buen comienzo: http://esl.about.com/od/speakingenglish/Speaking_English_Pronunciation_and_Conversation_Skills.htm Espero que esto ayude! I have also just started teaching Spanish in our elementary after-school program once a week. I love your lesson on colors, which is this week’s topic. I may borrow some of your great ideas. ¡Gracias por compartir! Thanks so much! Good luck teaching! I too am starting a Spanish enrichment club after school. How long did you run this club? I have found your lessons on number, animals, and colors. Do you have more? I’m starting my club from scratch and I would like it to be successful for years to come. If you have more of your experiences with your club I would love to read about them. So sorry for the delay – your comment somehow ended up in spam. We ran our club 1-2 times per month and focused more on cultural events – so if a holiday was coming up we would learn about it in Spanish, then do a craft, enjoy an authentic treat, see a video, etc. I have tons more lessons but haven’t had the time to post them. I am hoping to soon so please check back! Good luck!